Preterm births are a major contributing factor to Mississippi’s high infant mortality rate. One evidence-based intervention shown to effectively reduce the risk of preterm births is the use of the drug, 17 alpha-hydroxyprogesterone caproate, known as 17P, but there are barriers to its full use. The Center for Mississippi Health Policy has produced a fact sheet that provides background information on 17P and explores policy changes that can improve access to this drug. 17P is a synthetically produced version of a naturally occurring hormone used to reduce the risk of preterm births. It is shown to be most effective for women with a singleton pregnancy who are at risk for early delivery because they have experienced preterm birth in a prior pregnancy. Women who have had prior preterm births are 1.5 to 2 times more likely to have subsequent preterm births. 17P is shown to reduce the risk of preterm births in this group by as much as one-third. 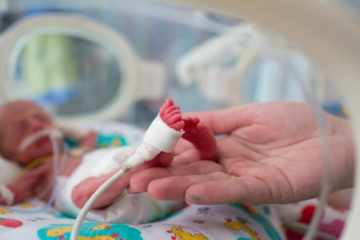 What is the impact of preterm births? Mississippi has the highest infant mortality rate in the country, at 8.2 infant deaths per 1,000 live births in 2014. Preterm birth is a major contributing factor to the state’s high infant mortality. The cost of preterm births for babies who survive significantly impacts the state budget. A 2014 analysis by the Center for Mississippi Health Policy estimated that the total costs of poor birth outcomes related to premature births in the state were $336.17 million a year. Considering that Medicaid covers over half the births in the state each year, implementing strategies to improve birth outcomes could have a significant positive effect on the state budget. 17P is most effective if given on a weekly basis for 20 weeks, beginning at 16 weeks gestation and continuing through 36 weeks gestation. However, the need for weekly administration has been cited as a significant barrier to compliance, particularly for women residing in rural areas of the state who must travel long distances to receive the weekly injection in their physician’s office or clinic. For years, a compounded version of 17P was used in Mississippi, as well as around the country, with women who were at risk of preterm birth. In 2011, Makena, a branded version of 17P, was approved by the Food and Drug Administration. Once an FDA-approved product is available, a pharmacist may not compound regularly or in inordinate amounts any product that is essentially a copy of that FDA-approved product. This change from compounded to branded product significantly increased the cost of treatment, which has created additional barriers by making it more difficult for providers to keep the drug on hand for administration. Medicaid, Blue Cross Blue Shield, and other insurers in Mississippi reimburse providers for 17P when its use is medically necessary. No or low-cost doses of 17P in its branded version, Makena, may also be available for a limited period of time to uninsured patients through an arrangement negotiated between the state and the drug manufacturer. Because weekly trips to a physician’s office for 20 weeks can create such a barrier to completing the course of treatment, some states are seeking out innovative ways to administer 17P in settings other than the provider’s office. Ohio’s Commission on Infant Mortality recommended legislation in May 2016 to allow for pharmacists to administer 17P if they are properly trained to do so and possess an order from a treating physician to give the shots. In Mississippi, Medicaid reimbursement for pharmacy administration of 17P would require legislation. Mississippi Medicaid currently pays for vaccines administered by a credentialed pharmacist. Expanding access to 17P for eligible pregnant women who are at risk of preterm birth has the potential to improve birth outcomes in Mississippi and lower Medicaid costs. Authorizing pharmacists to administer the drug when prescribed by a physician could significantly increase access to 17P and improve compliance with receipt of the weekly injections. For Mississippi Medicaid to pay for this service, legislation must be enacted followed by a State Plan Amendment. To download a copy of the fact sheet click HERE.